I did a "little" bit of shopping this week on my vacation and I found that contrary to what one might think, the midweek deals are amazing at stores such as J. Crew and Old Navy. More importantly, the selections are much more plentiful during this time as stores are just marking things down. In fact, I was caught in the midst of a major markdown on Tuesday at my local J. Crew. They were bringing things out in boxes while wielding that markdown-thingy machine. As you might imagine my eyes were aglow at the sight of this. It's actually a good thing that I don't get out much on the weekdays, because it could be dangerous! Below you will see my haul of good deals, many of which are probably still in stores. This week and I presume also this weekend, J. Crew is having an extra 40% off sale in store. (Plus an educator's discount if it applies to you.) J. Crew Factory is having an extra 50% off sale, plus there is a Gilt City coupon for 25% off on top of the 50% off. At these prices you can see why I went a little crazy! I am particularly looking forward to wearing this piece with the blush color Sunburst skirt and also my mint blazer. The colors are perfect together! Last off all, I stocked up on some basics. These sweaters on the left from the J. Crew Factory ranged from $9-$18. The Lobster Instaria Charely Sweater was one of my favorite finds. I almost paid close to retail for it last year and I am so glad I waited. I am going to Maine this summer so I can bedeck myself in head to toe lobster and nautical gear! Old Navy also had some great deals. 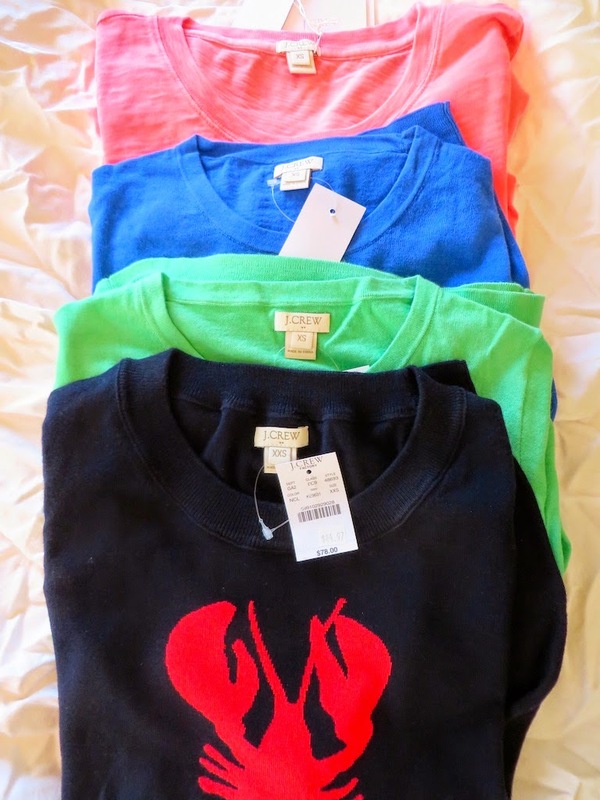 Most of their sweaters, including the two nautical themed ones featured above are marked down to $7.50. I don't need any more nautical themed items, but for this price it was full steam ahead. The California tee was marked down to $4.50. While I didn't buy the above Kate Spade dresses found at Marshall's, I had to try them on because they were like Sirens beckoning me to come hither! I should have resisted their seductive yet deadly songs, but what mortal woman could resist a Kate Spade dress? At $129.99, regularly retailing for near $400 (which seems insane to me) I really, really wanted to take one of these (maybe all of these?) home with me, but alas I thought I should refrain. I might go back in a few weeks to see if they are on sale. So, did you find any great deals this week? Do you plan on hitting the stores in search of bargains this weekend? Or like me, are you going to sit back and give your wallet a bit of a rest? Holy cow, you cleaned up! I am super jealous of that sequin bow shirt - my store didn't have my size and I'm not sure what to order. Ugh! I also will probably place an Old Navy order too (eying that California top!) and I adore the lobster sweater you got too! I really like the sequin bow shirt, although I ended up sizing up in it. Part of this was due to the availability of sizes at my store and also the arms seemed really small to me and tight compared to the rest of the shirt which was loose fitting. I wanted to get it in white too, but I thought one was enough! I think I am most definitely done shopping for this month! I am looking forward to styling what I have, it should keep me busy for a while!